Do Content Marketers Need To Have Writing Skills? In my recent post on the top skills for content marketing strategists, I listed 7 skills you should look for when hiring a content marketing strategist. The post was inspired by my own challenge of filling the role inside a large enterprise brand. It was also based on the large number of times I have been asked this question, especially recently, by mostly large brands. I think there are many different ideas about what a content marketing strategist or content marketing team lead is or does in a corporate brand role. There were a few comments in that post that questioned whether content marketing strategists should have writing skills. Janette Lonsdale simply stated that content marketing strategists should have writing skills. Gordana Stok went a little further and asked why writing skills weren’t on my list. She felt that the ability to take a story idea, interview stakeholders and put pen to paper should be on the short list of important content marketing strategy skills. First, I appreciate every comment I get. And actually appreciate the friendly challenging ones the most. So thank you Janette and Gordana for raising this question because I think it is a really good one. I also believe that all businesses need to bring in qualified journalists to join the content marketing team. When the budget is there for deep, original content, journalists should be deployed either on staff or as part of an outsources news room. Same holds true for photographers, designers, videographers, and other talent. But my post was about the skills needed for the content marketing strategist or team lead. I mentioned above that the context for me was large brands. For smaller or even medium-sized businesses, content marketers need to wear many hats. So in addition to the 7 skills I mentioned, writing is something I would look for in a smaller business setting. In the post I included “Inbound Marketing Mindset” as one of the skills needed. This includes understanding how to use digital platforms and analytics to gain reach using content. Hubspot calls this DARC skills (Digital, Analytic, Reach, Content) and this philosophy guided most of my hiring. So not writing skills specifically, but an understanding of how to use content to drive business results. I also included “Social Proof” as one of the skills. This could include experience building a social following with writing skills. But I was saying that I looked more for the desire and willingness and passion to contribute to online conversations in any form. In fact, I required my former team to write. But I did not hire them based on any past writing experience – only the attitude, if not the aptitude, for contributing in some way. For large brands, I would say not necessarily. Especially if you need a dynamic business person who can lead change in the organization. I have seen a few brands struggle by trying to turn former journalists into content marketing strategists. Do they have a place on the team? Absolutely. 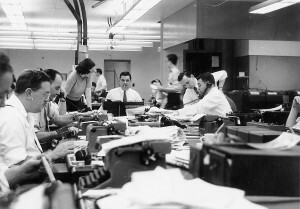 Do journalists have the ability to strategically run and manage a content marketing team? Yes! If they have a good portion of the other skills I mentioned. I think if we’re talking about a small or midsize company, or an agency, then the strategist should be able to point to some writing experience. Now if we broaden the question to content marketers in general, I would say writing skills are a huge plus. I would prefer it but until content marketing becomes a mature discipline inside large brands, I think we need change agents over writers if I had to chose. Digital Strategy: Experience and ideally management of the resources responsible for the publication of a brand’s content through social channels. More than just a community manager, you need someone who understands the channels your audience is using, knows the nuances and context for each, and knows how to maximize your company resources to drive impact across digital channels. Project management: Editors are project managers with a deep understanding of what your brand should be saying and how it should be saying it. I think you can teach editorial skills and you can train someone on your brand voice. But they need to have the ability to manage a plan and define a continuous publishing schedule (vs. campaign-based mentality). Analytics: My first content marketing hire! Content Strategy: (Combine original, curated, licensed and syndicated content to maximize reach). Inbound marketing mindset (Earn audience attention through search and social and convert it). (Bonus) A Sense of Humor: life’s too short to not have some fun. My problem with the “writting skills” as a new requirement now that is in my opinion “everyone” should have it. Everyone must be able to express their thoughts (if they have them!) in a written form. The idea that because you are an engineer you don’t need to know how to piece sentences together is naive at best. So for me “communicating effectively” is a core skill for any role. In my personal case the fact that I was a journalist and worked in corporate communications for many years has helped me do better marketing. I guess because I know when a piece is actually giving you information and if it’s engaging (would make the front page in the old days!). BUT when people ask me how to learn to do Content Marketing I always tell them: you need to read, A LOT. Wow Moraima, great thoughts in here. I agree with you 100% that everyone should learn how to communicate. And as a former journalist and a talented marketer I know from first-hand experience, this is great advice for all marketers. I also love the advice about reading a lot. I am constantly looking for great examples of effective communication in all forms. Hope all is well. I miss my friends from SAP! ahhh, we miss you too! And we miss the having fun part the most! As you mention, I think it depends on the size of the business. The term “Content Marketers” is very broad as well. I would be encline to differentiate between tactics and strategy here. In the end, being a “Content Marketer” is quite easy. However planning, crafting and distributing content in such a way that one maximizes its potential and becomes part of the bigger picture, the mission i.e. the strategy, that’s something which takes much more than just knowing how to write an article and tweet it once its published. Great perspective Mael, I think most people would agree with your definition and I certainly think you are correct. Tactical, hands-on content marketers should be able to write. And it is a nice bonus for strategists. I certainly love writing but don’t expect everyone to also enjoy it. Michael, thanks for dedicating a post to one of my favorite topics: writing. What I appreciate about your post is that you’ve helped me understand the perspective of large brands. Particularly, as you point out, about content marketing not being a mature discipline and, therefore, needing leadership from the content marketer to sell the idea internally and then build and sustain momentum. I tend to forget that coming from the technology start-up and SMB space. The companies I’ve worked for in the past were early adopters of content marketing, so I was never faced with that challenge. And because I wore many hats, as you pointed out, and had to take on both a strategic and hands-on writing role across marketing, sales and support, I was in a position to understand the bigger picture and make sure messages lined up across the content we produced in support of the buying and adoption journey. Thanks so much Gordana! I agree with you completely. As a writer and a content strategist, I think it has helped me to continuously build my writing muscle through regular practice. I get to learn what works and what doesn’t first hand and can apply that to the larger strategic challenges. But I also was not trained as a journalist. I became a writer because I wanted to. And that’s why I think the attitude and desire to write is more important than the experience. However, I do think it is a bonus for a content marketer at any level! The irony of the grammar flaw in the second sentence of this piece was impassable. In answer to your title question, an emphatic YES! For two primary reasons; for the content itself as delivered externally, and for the ability to explain/defend/pitch/justify/translate, etc. the content internally. Also, I would add to the skills list: people skills. The larger the company, the more nuanced one must be to address the content needs of diverse departments. That’s a good point Christopher. And one some others also made although more along the lines of being a good general communicator vs. writing skills. Every marketer (every business person?) should be a decent communicator. I also agree with you on your point regarding people skills. I think too many companies allow smart jerks to roam free and they wreak havoc on the culture, destroy morale and create way more harm than good. I agree that for smaller organizaitons or one man shows, you must wear many hats. Therefore, writing skils are a must. I however, love the 7 skills that you listed and especially agree that a sense of humor is critical. In order to have strong social proof, you must show people that you are real. A great way to accomplish this is with a sense of humor. I believe that even smaller businesses should utilize the services of at least one writer who can produce high quality content, perhaps on a per-piece basis at first. Because even if marketing team members are able to express their ideas relatively well in writing (which, as mentioned in a previous comment, they should be able to do), a professional writer should be available to edit and polish anything that is going to be put out there to represent your brand. Writing skills are just as important as the 7 other skills you have pointed out before. Content marketing involves understanding the influence of your content. To be to do that, you need a certain level of understanding like the nuances of writing. I agree that it’s not mandatory, but you get more brownie points when you have good writing skills. Michael, the comments in your previous post on adding writing to the required skills may stem from an increasing number of writers trying to add “content strategist” to their list of services. Some writers who are managing blogs and advising clients on what posts they should write think they should be called strategists. And several years ago, the Content Marketing Institute suggested journalists add strategist to their title, a suggestion they have since apologized for making. While communicating in writing is a good skill for any marketer to have, I think your 8 skills are most important and necessary for content strategists. I think you are absolutely right. It’s not a knock on writers, I just think writing is a creative skill that should be managed along with the other types of creative (design, video, etc). Strategy is a different thing. Doesn’t mean you can’t have both. But strategists need to be able to define and execute a strategy. I think marketer’s should have writing skills. I have a BA in Journalism, my APR in PR and a Master’s of Science in Marketing. As a Communications professional and strategist, I use the same tools Marketing is using to get my message out — and develop my own content. I am versed in today’s digital technology, analytics, strategy and writing. In my opinion with the lines blurring today between the two disciplines, a marketer who cannot put two sentences today is obsolete. I see way too much outsourcing in my company done by Marketing that could be handled in house by hiring marketing professionals who can use their fingers on keyboards, as well as their minds. Big or small there are economies that can be realized by marketers who can do as well as think. I agree completely. Most companies simply don’t share the stories from their own employees who have skills and interest in writing and telling engaging, personal and emotional stories. This is one of my big predictions for the future: companies start to tell personal stories from their employees, customers and experts.